Below you can read Tomomi Moriwake, a Japanese consultant, discussing the content of her last seminars on Japanese culture and management. The Fundamental Principles of Japanese Management. I'm very glad to see you are interested in learning more about Japan, because you will never be able to do business with the Japanese unless you understand some basic aspects of Japanese management and Japanese corporate culture in general. 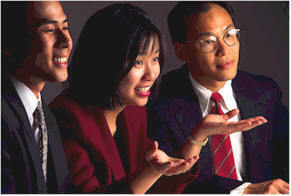 In my seminars, I usually talk about three fundamental principles of Japanese management. The first is the emphasis on the group in Japanese corporations. The second is the importance of human or interpersonal relationships. And the last point I discuss is the role of Japanese managers as generalists and facilitators. All right then, we'll talk about, briefly, these three principles. The first point then, the emphasis on the group. This group orientation manifests itself in a following example (you can yourself conduct this experiment). If you ask any Japanese businessman what he does, he will almost invariably answer by saying, "I am a Sony man", or "I work for Mitsubishi", or "I'm with such and such company", instead of telling you, if he's a... whether he's an engineer or an accountant, for instance, you see. This point, this emphasis on the group -the group orientation- explains the other two principles as well. For instance, Japan is geographically an island. It's an island nation, it's like a boat with an overcrowded homogeneous population. So, this explains partially already why this group orientation is so important and also necessary for the very survival of Japan and Japanese corporations as well. You see, by the way, the people are the only resource Japan possesses. It is an island nation without other natural resources. So it's the question of survival also. That leads us to the second question, the second emphasis rather, namely the emphasis on human or interpersonal factors or relationships. In this overcrowded island nation, in order to achieve or survive together, they have to learn, like I said, to get along, and in order to achieve this, there are certain things they have to learn, like harmony. How do you achieve harmony? By sacrificing a little bit of self-interest for the sake of the group. And also by compromising, by trying to have everybody agree, namely, to achieve or to arrive at the consensus of the group, you see. Once you are employed, or hired by the company, you remain with this company until your retirement, the so-called "lifetime employment". That explains a lot of things already, like seniority order, because you enter the company along with your peers, the same age group. You graduated from the university together, so you get promoted together, and so you climb this company, organizational ladder, little by little together, slowly but steadily. The last and the third point or principle is a view of managers or executives as generalists and facilitators, rather than decision-makers. In general, in a Japanese corporation, everybody is more or less trained to be a generalist rather than a specialist. Even if you are an engineer, when you have just joined the company, you will have this orientation and you will be transferred from one department to the other and you'll be rotated in every department of the company to familiarise yourself with the entire company and for instance, since you are not narrowly specialising in one field, you can take over somebody else's role. I also talk about ringisho, the so-called ringisho, usually translated as 'the management by consensus'. That means that all the employees participate in the process of decision making. They form small groups in each department and they discuss the matter with each other. They arrive at an agreement, the consensus, and then the departmental chief or the executive will have to agree himself or herself. And this way, the consensus is achieved. Everybody is involved in the process. It's not like, say, an American way of decision making by one big executive or the president. This is just a brief description of my seminars, but I think if you attend them, I can give you even more insight into Japanese corporate culture, which I think will help you greatly in your coming business trip to Japan.